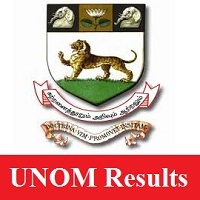 UNOM Results 2019: Well, candidates who have given their effort in the held Madras University UG/ PG BA, B.Sc, B.Com, MBA, MA, M.Sc, M.Com Results For November 2018 Examination must refer to this page. And the officials of the Madras University (MU), Tamil Nadu are ready to release the Madras University Semester Results of 1st, 2nd and 3rd Year on 4th February 2019. So, those who are eagerly waiting for the UNOM Exam Results 2019 over the internet can refer to get the exact updates. Remember, that you can only check them online from the official site. Moreover, we have also furnished the information about the Madras University Exam Results, the Revaluation/ Recounting @ unom.ac.in. Along with those, we have also provided the Madras University Exam Results 2019 Date, the steps to check out the unom.ac.in Result 2019. Finally, we have ended up this page with the direct link to find out the சென்னை பல்கலைக்கழகம் UG/ PG Semester Results 2019 online from the official site. Candidates who have completed their Semester Examination in November 2018 can check this page to get the exact information of the Madras University Exam Results 2019. Furthermore, the officials of the Madras University had not yet commenced the exact date to release the results. Most probably, the UNOM Exam Results 2019 will be announced in February 2019. So, candidates can get the latest update of it only from our page. Well, candidates from B.A, B.Sc, B.Com, MBA, MCA, MA, M.Sc, M.Com courses can get only their MU 1st, 2nd and 3rd Year Results online from the official site of the MU @ unom.ac.in. Moreover, the below link provided will be activated only when the UNOM Results 2019 is out. Those who have attempted the semester examination must and should have to know their results. And that will help you to know the next levels. Aspirants who are interested in Madras University marks recounting or revalidation can follow the below given table. So, by check that you can know the recounting fee and other details. Also, you need to take out the demand draft in the name of “The Registrar, University of Madras.” Those who are willing to pay the revaluation fee through online mode, the RV ID number is a mandatory one to be entered in the column provided for making an online payment. Candidates need to note a point that, they can even check the UNOM Exam Results 2019 on the official site. But due to the heavy traffic operating at a time, the server might be busy to get and retrieve all the unom.ac.in Result 2019 faster. So, to avoid such collisions, candidates should check any of the below listed sites without tensed. For that case, we here suggested the other websites to download and check the UNOM Results 2019. So, access your results in the websites. Visit the official webportal of Madras University @ unom.ac.in. Or you can click on the below provided link. If you are going through the official site, then click on the results tab that appears on the screen. Later on, you must hit the link that refers to the semester wise results. Furthermore, you must give your Roll Number, the password provided in the screen. Then, submit the page to access your Madras University Semester Results 2019. Soon after that, you must check your result. Download your UNOM Results 2019 and also take out the printed copy of it for further usage. Finally, we hope all the candidates have gathered all the detailed information of the UNOM Results 2019. So, keep in touch with us on our Freshers Now page, to get all such news.